The truth is this — on any given day, even when it seems otherwise, even when the fridge and the cupboards look a little bare, I have enough food in my house that I really don’t have to add a thing. Nobody here is anywhere even close to going hungry. We live in a culture of needing more than we need. The truth is also that I love farmers’ markets and good bread, an olive bar, fish mongers, cheese shops and the Bulk Barn, but I don’t like a house full of food. What I love more is a house with some food, enough that I can forage, but not so much that I always know ahead of time what I’m going to be eating. I rarely cook for a crowd anymore so I have this luxury. Sometimes I don’t shop for weeks, I challenge myself instead to figure out what can be made with whatever’s on hand… a decreasing amount of rice, chickpeas, flour, raisins, walnuts. Right now there’s goat cheese and Coronation grapes, apples, leeks, only one egg but a jar full of pickles. (I love how those tomatoes that need to be eaten turn into the manna of roasted tomato and oh-look-a-few-jalapenos! over a cup-of-cooked-quinoa-I’d-almost-forgotten-about.) And that egg. There are two of us. Will it be shared, scrambled with a bit of recently made pesto, a scraping of cheddar (because, look!! we have just enough)… or deviled and divided in two? Or will we flip a coin to see who gets to have it all to themselves? I know. It’s a wild ride in my world. But, honestly, some of my best meals have come from cupboard/fridge foraging. And some seriously cherished memories come from a time when this was a lifestyle not a choice, when I had very little and valued every tea bag, when something like mild euphoria would occur at the discovery there were still two Digestives left in the packet, when I’d thought there was only one. But we’ve all been some version of there, yes? Part of me still taps into that lack-inspired euphoria, maybe it’s why I’ve never really embraced shopping in any regular kind of way and why I’m so comfortable with my occasional (and relatively speaking) empty cupboards. Or maybe I just embrace a certain kind of culinary laziness. I know this is a privilege, this choice to celebrate the abundance by embracing the absence. 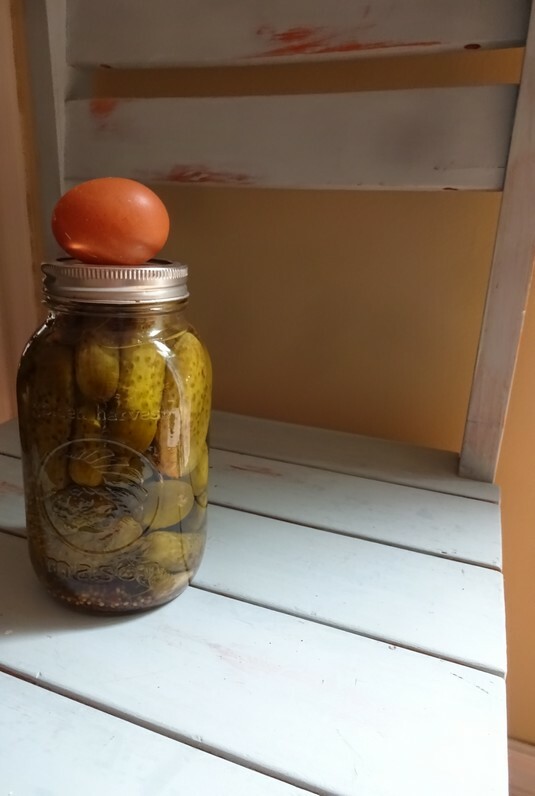 Not everyone has that choice and so there’s gratitude in equal measure for both the shortage of eggs and that full jar of pickles. Wherever your own wild ride takes you… happy Thanksgiving. And a very happy weekend to you, Naomi…! Love it! That looks like an interesting podcast series. Thanks for sharing. A lovely post on giving thanks for the little that is enough. Thanks, Alice. So little really is all we need. And mushrooms. Thank you! Truly makes me pause to consider the ampleness of my pantry contents. Brilliant thoughts. I admire you greatly. Thank you as ever for words you offer. This was a lovely little post. So beautifully written, and true! I look in my pantry and think ‘there’s nothing to eat’ but truly, I probably have more food in my cupboards than most people in third world countries can fathom.